If you are an Expert or Contributor to the npj Biofilms and Microbiomes Community, we want to help you get your work will noticed. The My Analytics tool is here to help! Here's how to use it. These days more of us than ever are writers and filmmakers. We have numerous outlets available to us for the sharing of our thoughts, opinions and knowledge in both written and video form. And what we all want to know is, ‘how many people have seen my work?’. 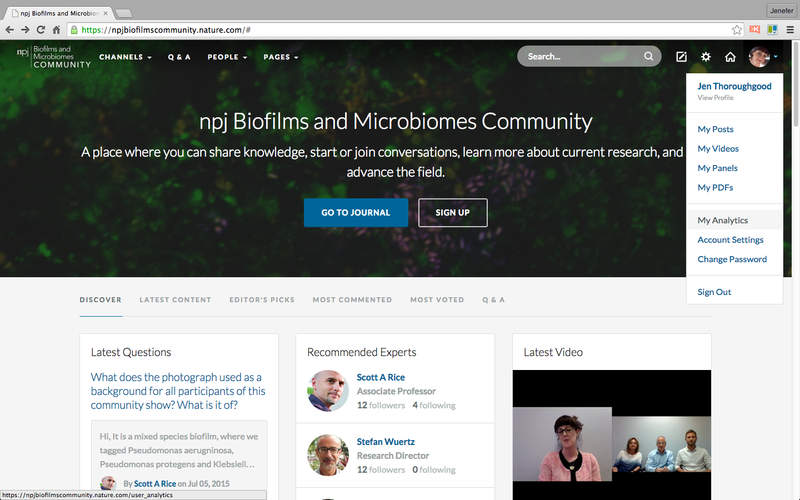 One thing you know for sure when you publish on the npj Biofilms and Microbomes Community site is that your work will be seen by a relevant audience. It is not being broadcast to the wide and unknowable world of social media; it is being seen by a group of people with a shared interest, who have visited or signed up to this community because they care about the research being done in the field of biofilms and microbiomes. 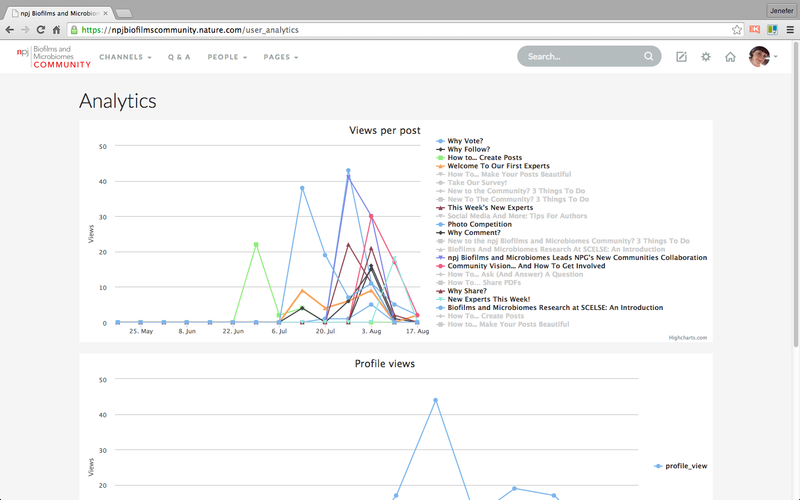 Furthermore, the My Analytics tool available to all Experts and Contributors gives you a quick and easy way to see which of your posts are attracting the most attention and how many people have looked at your profile. In the early days of our community, you should not expect to see huge volumes of viewers for every post you create, of course. But what you do know if that each of those viewers will have had a genuine interest in the subject-matter. To access this tool, click the drop-down menu next to your avatar on the top navigation bar on the community site and select My Analytics. 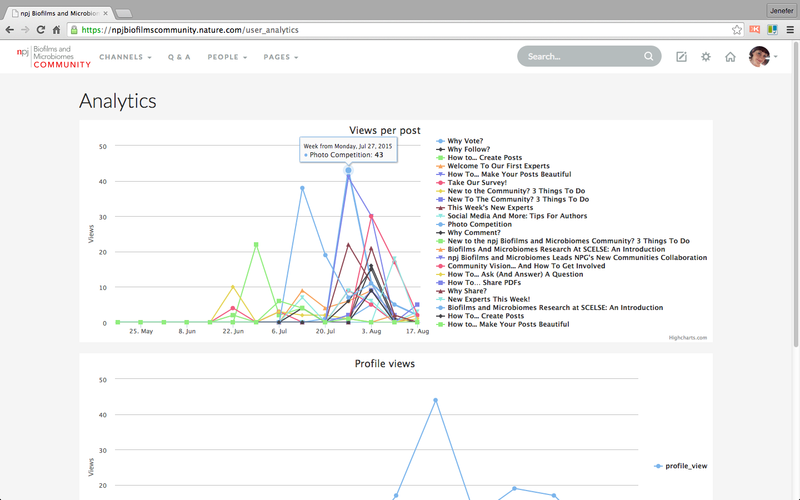 You will see two charts; the first shows all your posts, with the number of views per post. If you hover over the point at the peak of a post you can see its name in full and the number of views. You can see from the screenshot below that 'Photo Competition' is my most popular post to date on this community, with 43 views. If you want to see only how certain posts have performed, simply click on the posts in the list to the right of the chart that you don’t wish to see on the chart. Their titles will turn grey and their data will disappear from the chart. Use this data to see which of your posts are attracting the most attention, and try creating more of the same! This chart simply tells you how many profile views you have had over time. Use this data in conjunction with the data on posts to determine which posts are driving people to view your profile and learn more about your expertise. Don’t forget, profiles with photos and biographies get more views! 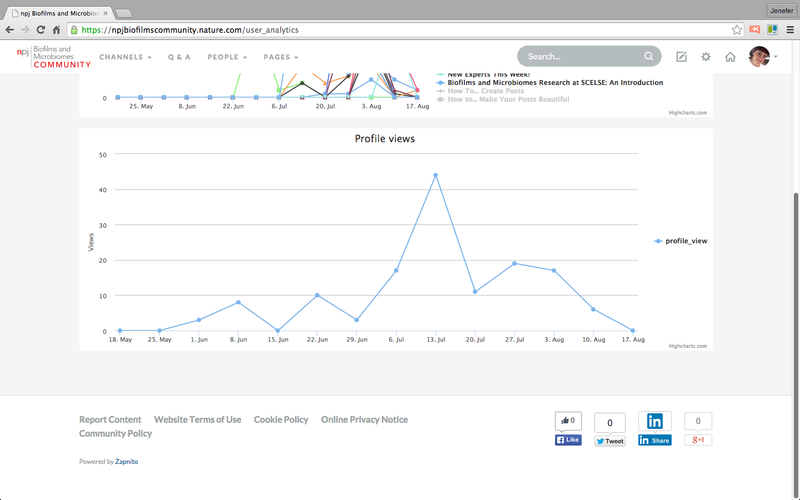 These simple reports in My Analytics help you understand how to engage with your community. If you can think of other reports that might be useful to you, tell us about them using comments or contact me directly.